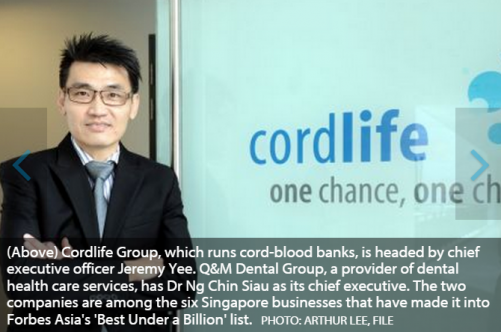 SIX Singapore companies have made it to Forbes Asia's "Best Under a Billion" list this year, which honours 200 leading public companies with annual revenue of between US$5 million and US$1 billion; they must also have had positive net income and been publicly traded for at least a year. Wee Hur Holdings Ltd, a construction and property development company. Forbes started out with 17,000 companies, and screened them for their sales and earnings growth in the past 12 months and over three years, and for the strongest five-year return on equity. Of the 200 companies, 123 are new to the list. This year, China and Hong Kong topped the list with 84 companies, down one from last year. The second largest group of companies on the list - 36, five more than last year - were from Taiwan. South Korea was third with 17 companies, up from 12 last year. India and Malaysia each had 11 companies on the list. Australia had nine, and Japan, eight companies, down from 15 last year. Singapore and Thailand each had six companies on the list. Tim Ferguson, editor of Forbes Asia, said: "The secret to making the 'Best Under a Billion' is consistent growth in the measured performance metrics. One 'off' year and you're out. Companies in sustained strong-growth economies, or, in Taiwan's case, exporting to such economies, have a decided advantage. It is also important to have a good, liquid channel for public stock offerings."